WIN an amazing Vacation for 2 to CANCUN! After surviving a frigid January, Nikki, Sam, & Andy want to send YOU somewhere HOT!! Listen to Nikki, Sam & Andy all week for your chance to WIN an all-inclusive getaway FOR 2 to The Royalton Suites Cancun Resort & Spa in Mexico ! Vacation better with Sunwing and experience an award-winning service every step of the way! How it works? 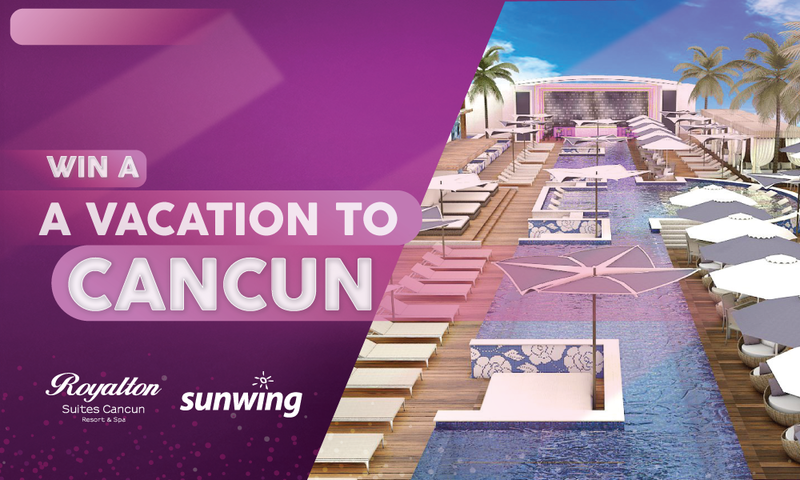 Listen for the ‘sunshine lyrics of the day’ in morning around 7:20, when you hear the cue, text the song name to 92925 and if Nikki, Sam, & Andy call you, then you QUALIFY to be in the FINAL DRAW on Friday for your chance to WIN an AMAZING VACATION FOR 2 to CANCUN!!! Nestled on the sparkling white sand shores of Cancun, the brand-new Royalton Cancun Resort & Spa provides All-In Luxury® vacations for every type of traveller. This luxurious all inclusive resort offers amenities and activities for all ages, from the Skyclub’s elegant rooftop pool and cabanas for adults. Foodies can indulge in a variety of delectable dishes at the resort’s wide range of cuisine options, from the sophisticated Hunter Steakhouse to the authentic Mexican culinary experience at Agave, all of which can be enjoyed with unlimited reservation-free dining. All-In Luxury™ continues with the resort’s luxurious accommodation options and exquisite amenities including signature DreamBeds™ with high thread count sheets, 24-hour room service and Royalton rain showers. The Contest entry period commences at 7:20 AM Eastern Time (“ET”) on February 11th, 2019 and concludes at 8:20 AM ET on February 22nd 2019, subject to subsection 5.5 of the Contest Rules (the “Contest Period”). 2.2. The Beat listeners who have won a prize from the Contest Sponsors with a value between one hundred and one thousand five hundred Canadian dollars ($100-$1500 CDN dollars)within a period of three (3) months prior to the beginning of the Contest Period are not eligible to participate in the Contest. The Beat listeners who have won a prize from the Contest Sponsors with a value equal to or more than one thousand five hundred Canadian dollars ($1500+CDN dollars) within a period of twenty-four (24) months prior to the beginning of the Contest Period are not eligible to participate in the Contest. Roundtrip airfare based on economy class for two (2) persons from Montreal to Mexico offered by Sunwing Airlines. 7 (seven) nights standard accommodation at the Royalton Suites Cancun Resorts & Spa in a room based on double occupancy. - EXCLUSION: All personal expenses to be paid by winner. (Meals, taxes, gratuities, all beverages, pre- and post-overnight layover hotel accommodations, insurance, souvenirs, incidentals, transportation, spending money and other personal expenses of the winner and his/her guest). 5. At selected times during the Contest Period; Nikki, Sam, and Andy will give listeners the “sunshine lyrics of the day”. Once the lyrics are given, the listeners will have to text 92925 with the name of the song. If Nikki, Sam, and Andy call them, they qualify for a chance to win an all-inclusive trip to Cancun, Mexico. 6. Listen to 7:20 Mornings with Nikki, Sam, and Andy (Monday through Friday) during the Contest Period. Around 7:20, listeners will have to listen for the sunshine lyrics of the day. Once the lyrics are given, listeners will have to text 92925 with the name of the song. If Nikki, Sam, and Andy call them, then they qualify for a chance to win an all-inclusive trip to Cancun, Mexico. Text within the allotted time. Answer the phone when Nikki, Sam, and Andy call. For the purpose of the Contest Rules, “Contestant” means each Contest participant that meet the three (3) criteria’s mentioned in subsection 3.2 above. One (1) Contestant will be randomly selected to participate in each contest attempt scheduled by the Contest Sponsors throughout the entire Contest Period (the “Contest Attempt”). If any randomly selected and texter does not meet the eligibility requirements, he or she will be disqualified. Contest Administrator will then select an alternate Contestant by randomly selecting the next texter until an eligible Contestant is identified. Decisions of the Contest Administrator in determining the correct text and selected Contestant for each Contest Attempt are final and binding in all matters relating to this Contest. Contest Sponsors are not responsible for telephone service outages, delays, busy signals, equipment malfunctions or any other technological difficulties that may prevent a participant from completing his or her text message, entering or participating in the Contest. Contestants may win in the Contest a maximum of one (1) time during the entire Contest Period. Any Contestant must be the participant who originally texted the phone to participate in the Contest. The text may not be transferred to any other individual at any time during the contest. No family members, friends, office associates, or any other person will be allowed to participate in the Contest on another person’s behalf. The Contestant must provide his or her own name and birth date. If a Contestant uses a false name or birth date, he will be immediately disqualified from the Contest and be ineligible to win any Prize. iv. his or her name, complete address, phone number and mother’s maiden name. vi. Following the random selection of each Contestant and prior to attempting the Contest, the Contest Administrator will require the Contestant to identify his or her complete name, address, and phone number and confirm that the Contestant is in possession of a valid driver’s license or government picture ID card, valid health card, valid birth certificate, and mother’s maiden name. vii. After confirming the Contestant eligibility, the Contest Administrator will then e-mail the contestant, confirm their information, request necessary information for the trip, and once the package is ready, they will get a call to sign the waivers and pick up their package. Contest Sponsors and all related parties are not responsible for any incorrect or mistaken announcement of any portion of the Beat around the World: Bruno Mars in Los Angeles printed on the tickets contained in the sealed envelope, or any miscommunication between a Contestant and the Contest Administrator regarding contestant information or the amount awarded. In order to claim the Grand Prize, the eligible Contestant’s name must match perfectly the printed on the certificate contained in the sealed envelope designated for that particular Contest Attempt, regardless of the actual date announced or any communication between the Contestant and the Contest Administrator. All Contest Attempts will be recorded in their entirety by the Contest Administrator. Subject to what is provided in the Contest Rules, the decisions of the Contest Sponsors are final, and the Prize must be accepted as awarded. 2 x Grand Prize (All-inclusive trip for 2 to Cancun, Mexico. ): In the event that a Contestant exactly matches the information in which the Contest Administrator has announced on-air to that particular Contest Attempt, then said Contestant will be eligible to claim the Grand Prize, subject to approval and verification of compliance with the Contest Rules. The Grand Prize is an all-inclusive trip to Cancun, Mexico, with a total value of $5,000 (CAD) (Five thousand dollars). Blackout periods apply, including without limitation: Feb 15-28, 2019; Mar 08-16 2019; Mar 23-31 2019; Apr 1, 2019; Apr 13-26, 2019; May 10-15, 2019; Aug 1-31 2019; Nov5-10, 2019; Nov 22-25 2019; Nov 28-Dec2, 2019; Dec 17, 2019-Jan 05, 2020, subject to availability. Present his or her valid driver’s license or valid government issued photo identification, valid health card, and original birth certificate to the Contest Sponsors.The information on the identification documents must match exactly the information provided by the Contestant during the Contest text message and e-mail.